My dissertation will be a hybrid of prosopographical analysis and videographic essay. Using ArcGIS (with some Tableau and SocialExplorer thrown in). For more information, message me. 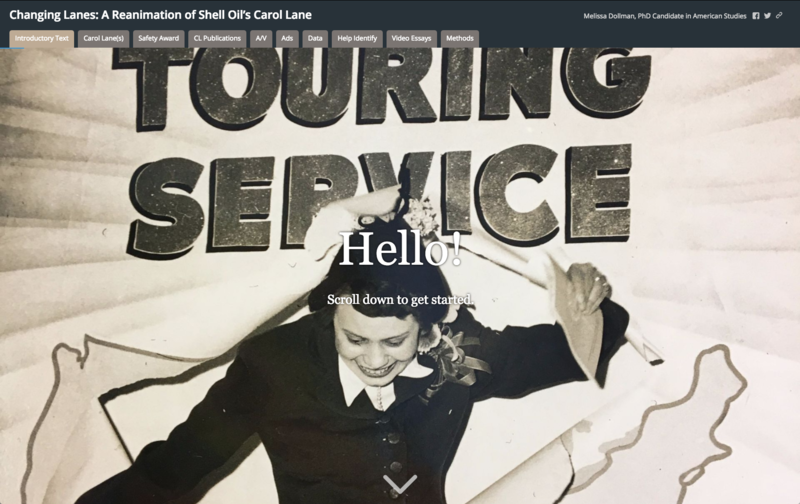 “Changing Lanes: A Reanimation of Shell Oil’s Carol Lane.” Chicago Colloquium on Digital Humanities and Computer Science (DHCS 2018), November 9-11, 2018. Recent recipient of a 2018 Digital Dissertation Fellowship from UNC’s Carolina Digital Humanities. Organized a mini-DH stream and panel at Association of Moving Image Archivists 2017 conference. Presented a lightning talk at American Studies Association 2017 conference. “Show Your Work” (2017). Essay on citation and documentary works. WHAT DO YOU KNOW ABOUT THAT?! Help us identify a person, place, event, or just share a memory to share about this digitized home movie (originally shot on 8mm film) from 1939! It was shot by previous mill superintendent M. G. Frye, and donated to the State Archives of North Carolina in 2007 by his grandson, Robert G. Frye. We placed prompts throughout the video which appear with each new scene, and stop the video. You can use the play and rewind buttons to review a clip. If you have information to share, please fill out the form below and don’t forget to give that timecode number! Then click play again to continue. If you’re identifying people and you know one or more in the image, identify people as they appear on the screen from left to right, such as “second from left” and so on. Use the same method to point out a business, building, house, street name or any landmark. Then don’t forget to click on “Submit.” And gosh, we really do thank you so much for contributing your valuable knowledge! We use this email to contact you should we have any additional questions, or need clarification. See the little number in the right bottom of the video player. Please only describe one section of video at a time by time code. Then click "Submit". Want to speak with a CHW team member? I have items to donate to the Rocky Mount Mills project.